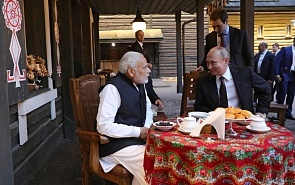 In recent years, annual Russian-Indian summits have become a tradition. In 2018, the two countries’ interaction at the highest level is expanding, which is confirmed not only by the regular meeting at the level of ministers and national security advisers, but also by an additional meeting of Vladimir Putin and Narendra Modi in Sochi in May. Unlike that “informal” summit that lacked, according to officials, any clear agenda, at the upcoming New Delhi summit there are several “final” agreements to be signed, which have been discussed over the last 2-3 years. Military-technical cooperation is the main area of interaction between the two countries and the basis of Russian-Indian relations over years. Historically the USSR/Russia was the number one supplier of military equipment to India. Even though New Delhi has diversified its defense partners, Russian weapons make up 60% of all Indian imports. At the upcoming summit, India is going to sign large contracts for purchasing five S-400 anti-aircraft missile system complexes, four Krivak-class frigates, 48 ​​Mi-17 helicopters and 200 Kamov Ka-226 helicopters. It is noteworthy that the final stage of negotiations on these agreements fell upon the period when the main Russian exporter company Rosoboronexport appeared in the US sanctions list, and the widely known American “Countering America’s Adversaries Through Sanctions Act” (CAATSA) endangers India with falling under secondary sanctions. Regardless of the decision US President Donald Trump will take, Russia and India will have to establish a reliable scheme to pay the contract in other currency than the US dollar. Using the ruble-rupee scheme or any third-country currency, such as the euro or the Singapore dollar, is the most discussed option. The share of the ruble in bilateral trade is already about 20%. Nevertheless, transition to any of these schemes, especially for multibillion-dollar deals, could be a serious challenge, which requires the two countries to think creatively. Using the national currencies is not so easy due to India’s negative trade balance (it exports to Russia $2 billion worth of goods, and imports $8 billion), and the volatility of its exchange rates. Despite the difficulties that the sanctions cause, discussing the ways to overcome them brings Russia and India closer. Both countries oppose using restrictive measures, which is likely to be reflected in a joint statement or other document on the results of the Vladimir Putin-Narendra Modi summit. The need to harmonize positions in response to the actions of the Trump administration promotes, in some sense, their relations, as it forces Russian and Indian officials to coordinate positions and meet on a regular basis. Cooperation in the energy sector is the second significant area of ​​bilateral cooperation, which is surely to become an integral part of the upcoming talks. At the moment, Russia is the only country in the world building nuclear power plants in India. Considering Kudankulam NPP in Tamil Nadu, two units are being in use successfully, another two are in construction, and the agreements for the fifth and the sixth ones have been signed. Now the parties negotiate on a site to construct another Russian NPP. Russia and India also cooperate in Bangladesh, where the project of the first NPP in the country’s history, Ruppur, is under implementation. Russia becomes an important gas supplier to India. The first supply of LNG occurred in June 2018, while in general, the contract between Gazprom and GAIL is for 20 years. It cannot be ruled out that the Iran-Pakistan-India offshore gas pipeline project will be the subject of the negotiations. Last week, the Energy Ministries of Russia and Pakistan signed a memorandum of understanding on this, so Russia and India are expected to sign a similar document soon. We should note that cooperation in the energy field is developing in both directions. Indian companies invest actively in energy projects in Siberia and the Far East. They proved themselves interested in increasing investment in the Vankor oil and gas field in Krasnoyarsk Krai. Between the two countries, there is also a potential to develop the space cooperation, which is likely to be added to the meeting’s agenda. In August, Narendra Modi announced his plans to launch the first manned space mission by 2022. Roscosmos is ready to train Indian cosmonauts and to send them to the International Space Station with its own spacecraft. Other potential areas of interaction in space include participation in a joint satellite group on remote probing of the Earth, projects in the field of rocket production and engine building. The three main topics of the upcoming summit are military-technical cooperation, energy, and space. All of them emphasize the strategic nature of the partnership between Russia and India. At the same time, one has to understand that each of them could become a field of rivalry. External challenges, such as the US sanctions, and the emergence of new players in the Indian market of weapons and energy can change the balance of power. To reduce the level of sensitivity to such changes, Russia and India have to expand cooperation, including new areas of interaction. Information technology, artificial intelligence, robotics, nanotechnology and supercomputers are the fields that determine the development of humankind in the 21st century. They have already been mentioned in the two countries’ joint statements. Unfortunately, there are almost no examples of successful interaction between the two in these promising areas. Thus, dependence on traditional areas of cooperation remains a challenge to the development of Russian-Indian relations in the long term. In the near future, a bilateral summit will take place to demonstrate that Russia and India have a lot in common. It will allow us to take a step forward in the main areas of strategic partnership.